Luke Rockhold may have left Las Vegas with his middleweight title in tow, but the reigning Strikeforce champion didn’t do so unscathed. 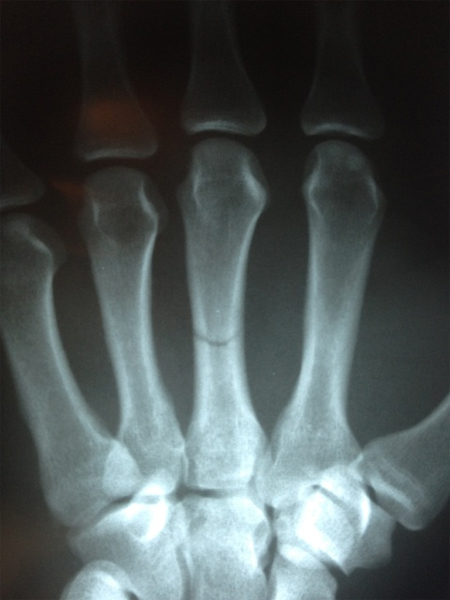 Rockhold suspected he had injured his right hand during Saturday’s TKO victory over Keith Jardine, and recent X-rays taken of his haymaker confirmed that it is indeed broken. “[Expletive], not exactly what I wanted to see!” Rockhold tweeted accompanied by the above pic. The 27-year-old’s hand will remain in a cast for roughly four weeks, which will then be followed by two to three weeks of rehabilitation before he can resume training. On Monday, Rockhold was placed on medical suspension by the Nevada State Athletic Commission until July 6th because of the injury. However, the American Kickboxing Academy-trained fighter can return to action sooner with a doctor’s note. Rockhold bumped his record to 9-1 following his 1stRound disposal of Jardine. The win marked his first successful middleweight title defense since capturing the crown from Ronaldo “Jacare” Souza in September.